In this second collection of tales starring the mismatched Green Lanterns of Earth, Jessica Cruz at last learns why her partner, Simon Baz, carries a gun in addition to his power ring! And the Guardian's greatest secret, the Phantom Lantern, falls into the hands of an evil presence from Jessica's past, giving him control over all aspects of the emotional spectrum! 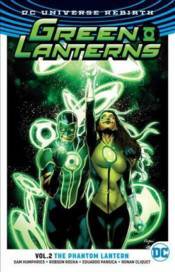 Collects GREEN LANTERNS #7-14.